With the Sun in Taurus (sensuous, indulgent, and naturalistic) and the moon in Gemini (inquisitive, observant, and eager), today is a Page of Coins day. 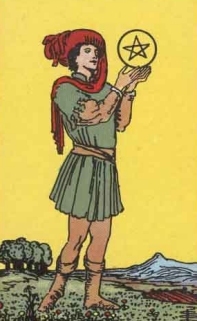 In the tarot, the Page of Coins represents a tender, young soul who is amazed at the wonder of the universe and whomever – or whatever – created it. In many respects this is most spiritual card in the deck. Thus it is not surprising that on a Page of Coins day you are motivated by a genuine desire to learn – both through study and meditation. You needn’t be in a temple, church, or mosque to find that for which you’re looking. Intuitively, you know it can be found in the wild, sweet song of a meadowlark as well as in the whirring of a well-oiled factory machine. This attitude of pure wonder is both the promise and danger of a Page of Coins day. In the Kabbalah, the Page of Coins corresponds to the attitude of kavanah, mindfulness or holy intention. With kavanah, everything is experienced as blessed. In this state of mind however, it’s all too easy for your spiritual quest to turn into one purely of the material world. For on a Page of Coins day, all that glitters appears to be gold. Unless you’re particularly vigilant (i.e. cultivated kavanah requires conscious intentionality), you’re as likely to seek money, prestige, and power as you are something of more lasting value. Whichever you choose, know that in the tarot the Page of Coins heralds the arrival of that which surprises as well as other un-looked for news. In other words, be careful of what you seek today because you might just get it.